Capitol Dance Company has been serving San Jose and the South Bay Area since 1978, educating students two years old to sixty years young in the art of dance. For over 40 years, we have grown and expanded while maintaining our positive reputation for quality dance instruction. We are a family run business that is fortunate to be able to share our love of dance with you! Our variety of classes allow every dancer to enjoy learning while building upon their technical skills and style. CDC classes are centered on age and level appropriate instruction. We offer dance programs in Ballet, Pointe, Jazz, Lyrical, Contemporary, Hip Hop, and Tap for beginner to pre- professional dancers. We believe that we are not only teaching dance but also instilling positive life skills for our students to use in all areas of life. We offer a variety of performance opportunities to our dancers including Performance Awards, Competition Teams and our Annual Summer Performance. Our teachers are skilled, passionate and committed to their students. We encourage you to visit our studios and invite your dancer for a free trial class! You will discover for yourself why Capitol Dance Company is a fun, enjoyable and educational experience in the art of dance. 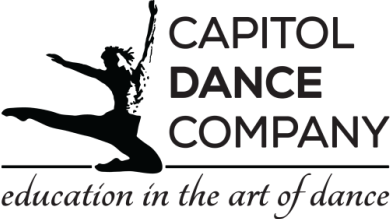 Capitol Dance Company is a member of The American Society of Composers, Authors and Publishers.